Is a Total Ankle Replacement Right for You? Total ankle replacement surgery, also known as ankle arthroplasty. Arthritis can occur in any joint of the body. Arthritis can occur at any age, and there is typically no cure for the disorder. There are various treatment options available. Treatment can allow patients to manage their pain and still stay active with their daily lives. Arthritis can occur in the ankle joint, presenting as three different types: Osteoarthritis, also known as degenerative joint disease, affects many people typically after they reach middle age. Over the years, the cartilage becomes worn. Rheumatoid Arthritis is typically a body wide disease and is caused when the patient’s immune system destroys healthy cartilage. And finally, Post-Traumatic Arthritis develops after an injury to the joint. This type of arthritis is similar to osteoarthritis and can be seen years after a fracture, severe sprain, or other injury. Ankle arthritis can present itself as swelling, pain, or limited motion of the joint. Patients often explain this as a gradually increasing problem with no that did not start in any particular way. A doctor can diagnose this arthritis through obtaining medical history, performing a general lower extremity exam, X-rays, and sometimes bone scans, MRI or CT scans. Arthritis can be treated in various ways. Nonsurgical options include oral pain relievers such as anti-inflammatory medications, orthotics or inserts for shoes, ankle braces or custom ankle-foot orthosis (AFO), and physical therapy. Surgical treatment can be utilized when non-surgical options fail. Surgery is dependent on the type of arthritis, and the location of the arthritis. Surgery used for ankle arthritis can include ankle arthroscopy (using a camera scope inside the joint through a small incision) with cleaning of the joint, as well as fusion of the joint or a total ankle replacement with an artificial implant. Total ankle replacement surgery, also known as ankle arthroplasty, is when the damaged joint is replaced with an artificial joint. There are many types of total ankle replacement devices used today, and the specific type used is based on what is best for the patient. The general procedure lasts about two hours. The surgeon makes a long incision on the front of the ankle joint, and, using careful dissection to avoid the arteries and nerves, the surgeon enters the ankle joint. The next step is to make bone cuts along the ankle joint bones to allow for placement of the new joint. 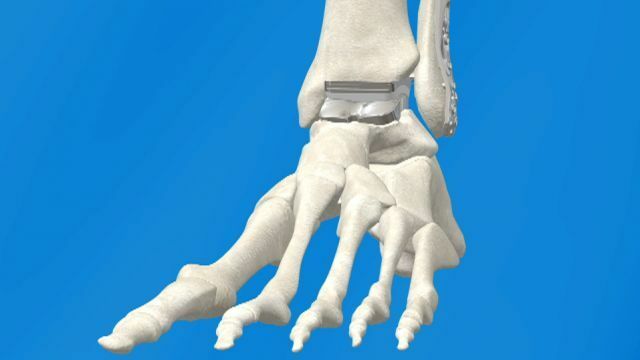 The new joint is implanted and the ankle is placed through range of motion to identify proper placement and position. The surgical site is then closed and the patient is placed in a bulky dressing. The patient remains off weight bearing to the ankle for many weeks following surgery. Not everyone is a candidate for an ankle replacement. Patients with poor circulation, loss of sensation (neuropathy), or a significant boney deformity related to a birth defect are not ideal candidates. Patients with history of infection or other boney defect are also not ideal candidates. Further problems include heavy work, heavy level of sporting activities, obesity, and smoking. Many patients who undergo total ankle replacement do very well, and are able to return to their activities as desired. If you have had chronic ankle pain, please do not hesitate to contact us at Indiana Podiatry Group, as we can figure out what is causing the pain, and help get your ankle back into shape so you can do the same.